People sometimes ask me why they should be interested in contemporary realism when there is the camera, and cheap, good digital photography is now everyone's hobby and expertise. The answer to that question is another blog post. I think that most people just assume that contemporary realists must use photos in making their paintings; accordingly, most people think that the highest compliment they can pay to a realist artist about his or her work is that it looks "just like a photograph", which is well-intentioned and thus nice to hear, but isn't really what I was going for. I think mainly the statement is supposed to convey how impressively real the figure looks, and because of the absolute proliferation of photography and digital images, we come to see reality through the eye of the camera lens; in other words, we no longer really know what "real" looks like on its own. Before I went to Water Street Atelier, I practiced copying master works from good images I found in art books. Because I had a very naive understanding of color-- both as it relates to photography, reproduction and paintings-- I tried to copy the exact color I saw in the color copy I'd made from the Jansen. During and after Water Street, I've never used photos in making my art work, except for now. I recently was commissioned to create a portrait of a woman who is deceased. Her son, who commissioned me, asked me to capture her when she was younger and gave me two small 4 x 6 black-and-white photos to use. His wife, who like his mother is Haitian and has a similar build (though I wouldn't say similar face), sat for me and I am using a little color study I made of her as the basis for the color on the final painting. It's been a challenge, but a lot of fun too, to think through the problems and advantages relying on photography poses, but mostly fun to compose the painting with disregard to what is (and is not) out there in real life. In other words, no need to worry about any one-to-one (or one-to-?) correspondence between the painting and reality, between "appearances" and "things in themselves", to evoke Kant. The immediate impetus to write a little bit about this came from an article in Sunday's NYTimes about a reunion of Norman Rockwell's former models. According to this article, apparently the artist was very specific about the pose and expressions his models, who were mostly friends and acquaintances from his hometown in Vermont, would take. However, a "photographer was always on hand and took numerous pictures, which Mr. Rockwell would refer to while painting." The person or the scene in his paintings was often a pastiche from many people and many photographs. "While Mr. Rockwell took certain characteristics of his models — the particular curve of a smile or width of ears — his illustrations and paintings were highly staged, models and Ms. Moffatt said. 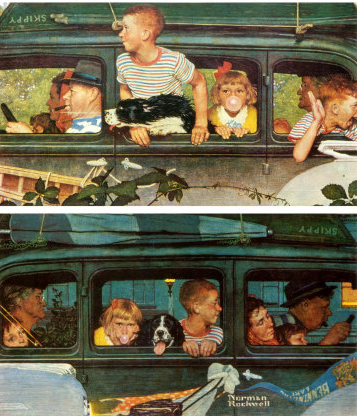 Mr. Rockwell would often photograph each model individually and add them to a painting. Sometimes he would take features of one individual, a strong arm or prominent nose, and paint or draw them on another person. For 'Going and Coming,' for example, he photographed Ms. Clark’s grandmother sitting in a chair, then painted her riding in a car." Newer PostI love Redheads-- even natural ones.